AF12: Visit East Africa. Price: € 13.00. 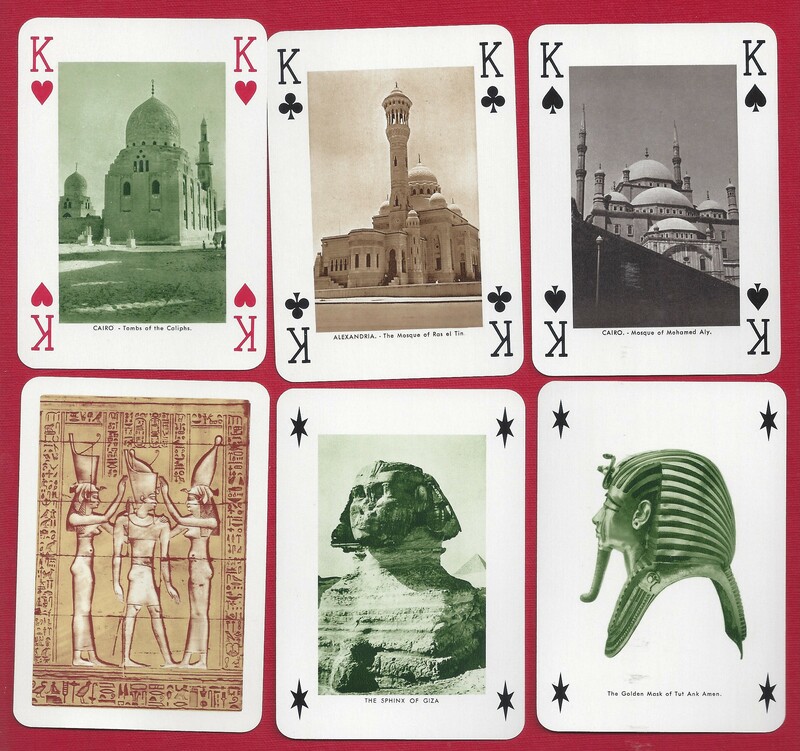 In th 60es the Spanish firm in Vitoria issued a series of decks about Africa. This is possibly a slightly later version from the end of the 60ies. But it may be published in Africa? I don’t know. Unused deck with gold corners. In yellowed, worn plastic box. On all cards it says “Do help save us!” and there are photos on all cards. AF13: Egypt. Alexandria. Farao. Price: € 5.00. Two decks from the firm Moharrem. 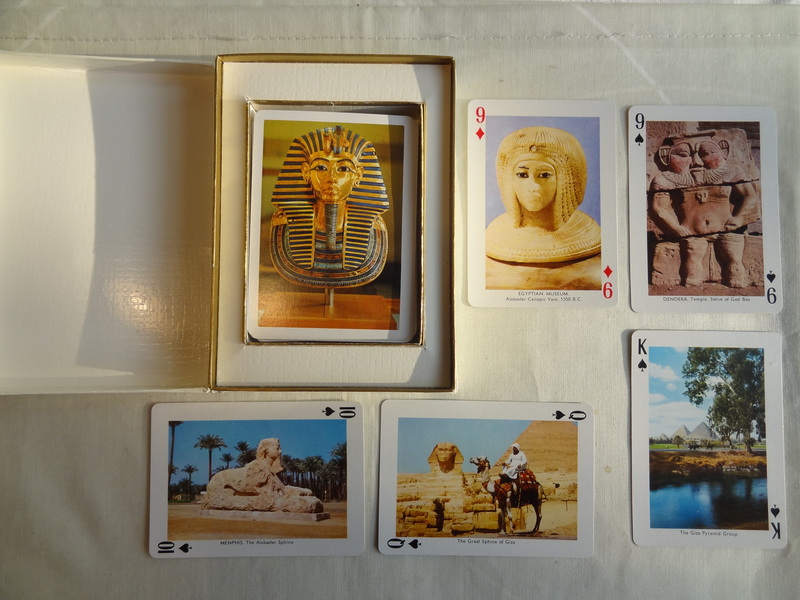 Both with a pharaoh and hieroglyphs on the reverse. In the company logo there is a camel driver. 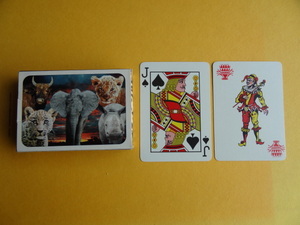 Both decks are used, each with two jokers. AF14: Egypt. Cairo. 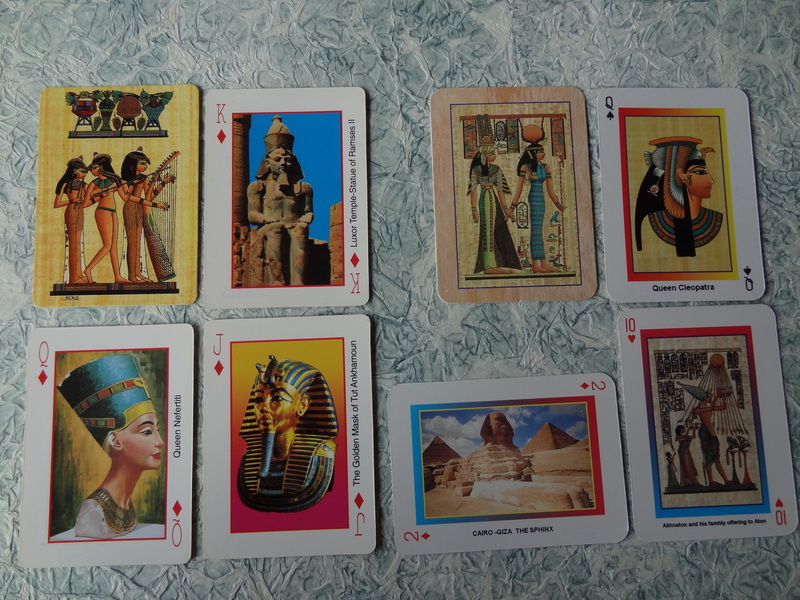 Pharaonic Playing Cards. Price: € 2.00. The front with anglo-american figures. 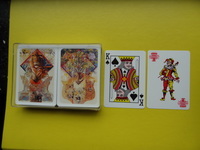 The deck is produced by Fournier in Spain, and with a Spanish tax stamp on the four of Clubs. On the box there are remnants of a Spanish tax stamp AND an Egyptian stamp. Worn cards. The box with torn edges. AF15: South Africa. The Big Five. Price: € 8.00. The five BIG are lion, elephant, rhinocerus, buffalo and leopard. 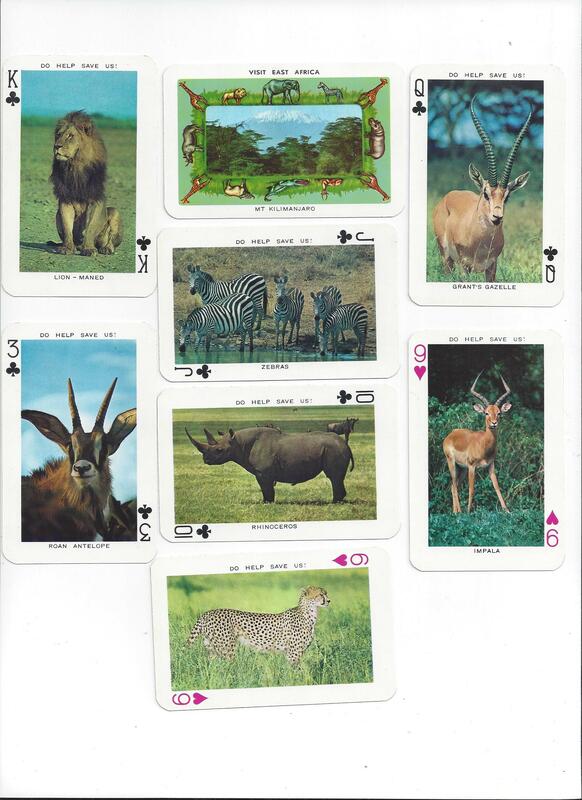 This double deck is with lion and leopard in the form of very nice drawings by Max Enslin. Unused deck, each with two jokers. AF16. South Africa. Rhinocerus. Price: € 4.00. A part of the series THE FIVE BIG, which ar rhino, lion, elephant, buffalo and leopard. Drawings by Mark Enslin. Beuutiful and powerful. unused deck with two jokers. In original box, I have two decks. AF17: South Africa. Elephant. Price: € 4.00. A part of the series The “Little” Five. unused cards in box. AF18: David Roberts (1796-1864). Price: € 4.00. Scottish painter and his exotic paintings from Egypt. 4 x 13 motifs + 2 jokers. Very slightly used. In box. AF19a-b: Pharaonic. Egypt. Price: € 3.00/each. Two different reverse ill. With different motifs on all cards. 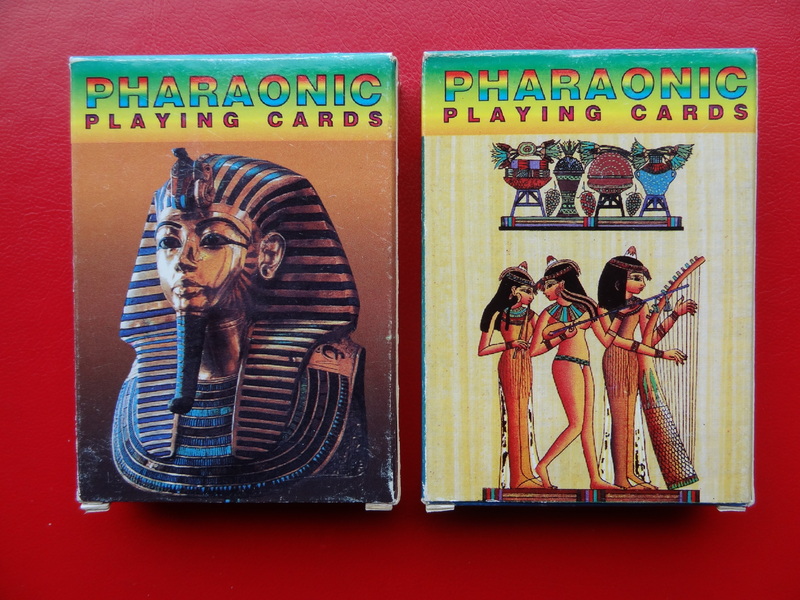 AF20c-d.: Pharaonic. Egypt. Price: € 3.00/each. Two different reverses, – but as both decks are unopened, I can not see whether the pictures are the same in the two decks. AF21: Vitoria. Egyptian Monuments. 1980. Price: € 15.00. Unused deck in slightly worn original box. 2 jokers. Photos on all cards. AF22: Tunisia. Price: € 3.00. A new deck. Quite ordinary, and therefore quite extraordinary. Unused, but with a faded Ace of Spades. 1 joker, no box. AF25: Protea, South Africa. Price: € 4.00. A normal deck, but it is not normal that we have decks from South Africa! Unused cards in box. 2 jokers.